In Parallels and Contrasts Between Mitt Romney and Raila Odinga, I posed the question why are all presidential contenders so bent on “stopping” Raila from ascending to the presidency of the Republic of Kenya. First, Raila presents the most threat to their ill-gained wealth, corruption and impunity. In a blog to be posted soon, I will discuss 10 things that must be on the To Do List for our next president and leading that list is taking corruption head on for the first time and ensuring an end to impunity for real. No one can make a case that passes the laugh test that there is anyone among those vying who is better suited to address corruption and impunity in Kenya than Raila himself. In a rational society, this fact alone would be a sure-in for Raila as president. Unfortunately, however, we are not dealing with a rational society when it comes to Kenyan politics. Characterized as it is by individuals who would lie, distort and manipulate facts at will for their own selfish needs and without caring one whit about the average Kenyan, and given the abundance of illiteracy, tribalism and a general lack of information or sophistry among a large segment of our population, these shameless politicians have and continue to believe they can get their way regardless of truth, fact or welfare of our country. Second, the so-called G7 or otherwise those bent on “stopping” Raila, are driven by an abnormal level of mixed hate and jealousy for Raila that is unprecedented and unparalleled both in Kenya and the rest of the world. Every country has a presidential candidate a good segment of its population just can’t stand or simply hates but usually this is along ideological lines. The level of hatred and intensity directed at Raila by those who hate him cannot be attributed to ideology at all. Rather, people hate Raila or can’t stand him largely because of his tribe or based on false information and beliefs they hold to be true when it’s simply not true. Leading in the spreading of that hate and vitriol are none other than Raila’s political opponents who know that is the only way they can hurt him politically, given they are all individually or collectively lightweights compared to Raila and his accomplishments as a leader. Finally, but not least, the so-called G7 and other Raila haters are determined to gang against him because Raila is popular among Kenyans from all walks of life save for the tribalists and those brain-washed by the same G7 crew. What they don’t understand is, no matter how much they smear and drag his name through the mud, Raila still remains popular and, like Mitt Romney, he will emerge at the top despite all manner of effort to stop him from getting there. The only difference is, while Mitt Romney’s top may be the nomination as flag-bearer for the Republican party, Raila’s top will be the presidency of Kenya he was previously given the nod but not sworn. In that blog, I deliberately left out another reason I can add now and that is, revenge. It is not lost in anyone’s mind who follows Kenyan politics closely that Raila humiliated Moi and his pet project in 2002 by endorsing Kibaki and undisputedly making it possible for Kibaki to crushingly defeat Moi and his Uhuru project. It would be naïve to think Moi would not want to exact some revenge by either single-handedly stopping Raila from being reelected as president, which Moi cannot do or working with others, which he can and a compelling case can be made this is exactly what the old man is doing—with his signature grin. Knowing why all these characters are banding together to collectively block Raila from being reelected as president is only half of the story. The rest of the story must answer the question to what extent are these characters willing and able to go to make their wish happen? The answer to this question is frightening, to say the least. According to impeccable sources, there is a plan afoot to impose a leader on Kenyans no different from how we had one imposed on us in 2007. Put another way, there is underway execution of a plan to defy the people’s will and propel to State House someone who is more acceptable to the masters of corruption and impunity than one Raila Amolo Odinga. This plan was not hatched recently. From even long before 2007 and formation of the coalition government, the Kibaki succession game (KSG) was on and is still ongoing. In fact, the KSG started right after Kibaki was sworn in his first term as president in January 2003. As I noted elsewhere on my blog penned in June last year, the “excitement [of 2002 elections] was short-lived, however, because no sooner had Kibaki taken office as president did he make it known Raila was not to be a factor in his administration, let alone the prime minister he had been promised in the haggling and dealing leading up to the 2002 elections. The plan at this stage was simple: Make Raila irrelevant in the Kibaki administration notwithstanding his “Kibaki Tosha” endorsement which undisputedly made it possible for Kibaki to be elected as president in 2002. Outwitting his rivals and opponents, including Kibaki, Raila mounted a populist campaign against the establishment, delivering them a fatalistic blow with his defeating them in their efforts to shove down the throats of Kenyans a bad constitution back in 2005. By election day 2007, few people doubted Raila had won the hearts of Kenyans and would become the next president. As it turned out, the few who doubted had more than doubts in mind as history will show they masterminded a rigging scheme that ensured that Raila would not see the inside of State House as president following that election. Then, of course, came PEV. And then the evading of a civil war and formation of the coalition government. With the coalition government committed to paper and in place, KSG resumed. Call it KSG Round 2 and here, the scheme was strategically similar to KSG Round 1 and that is, the idea was to once again try and make Raila irrelevant this time around in his capacity as Prime Minister. Unfortunately for the schemers, however, Raila had one up the sleeve on them I will not disclose quite yet but leave it dangling for those able to put two and two together to figure it at out in the end. Utilizing this “one up the sleeve” factor, Raila effectively rebuffed these efforts to make him irrelevant and, in fact, turned it to his advantage to the point the schemers had to go to Plan B. Plan B had to do with efforts to topple Raila from the pinnacle of ODM leadership and therefore from the Kenyan political scene. The star player in this Plan B scheming was none other than William Samoei Ruto, who quite frankly was wholly un-expecting when thrust into that role albeit willingly and gleefully so. For more about this Plan B and why it failed, go to Who Is William Ruto Part VI: The Succession Game and Why The Scheme To Topple Raila Failed. Meanwhile, Ocampo’x ax was falling while these schemes were busy plotting and on December 15, 2010, the ICC Chief Prosecutor made public those he says were the most responsible for PEV. On that list was none other than William Ruto himself and his now bosom buddy, Uhuru Kenyatta. In a normal society, one would expect one named as a suspect in such a serious case to take a low profile or otherwise try to deal with the case but, in the case of Ruto, his profile was, in fact, raised with none other than Kibaki himself publicly signaling Ruto was welcome in his inner sanctum. Indeed, at the height of this cozy relationship with Kibaki following the Ocampo’s naming him as a crimes against humanity suspect, Ruto’s ego got so big he could not contain it—but the newfound love between the two could not last. Much as he quickly shot to Kibaki’s inner circle, Ruto quickly found himself outside of it wiping mist off the window from where he was trying to look inside to see the goings on and wondering what happened. The occupiers at the inner sanctum must have come to the conclusion Ruto could neither topple Raila nor could he be a viable option to support for the presidency. That did not mean he was completely useless. As long as they had some use for him and he had hopes he could ride on the coattails of whoever they succeeded in once again shoving down the throats of Kenyans as they did in 2007, if they do, then so much the better he hanged around and he did. With Plan B a failure, namely, attempts to use Ruto to topple or otherwise cripple Raila as the leading presidential contender he is, the schemers were full gear on to Plan C.
Enter one Musalia Wycliffe Mudavadi. Mudavadi’s induction into the KSG was not by accident but the outcome has been nothing but a complete roadside wrecking of the political career of an otherwise dull politician. Okay, I may be ahead of myself here so let’s step back and examine this not-so thrilling episode in the KSG. When the ICC confirmed crimes against humanity charges against Uhuru and Ruto early this year, it became increasingly apparent that neither of these suspects could rationally be allowed to seek the presidency and that the only way they would do so, would be against the wishes of a majority of Kenyans who have not and may never forget PEV. With this in mind, Plan C was hatched and immediately put into action and here, the order of business was very simple: find an acceptable candidate both Uhuru and Ruto can support (read and their blind, tribal followers) and more importantly, one who would do the bidding for the masters of corruption and impunity. Looking throughout the landscape, they saw one in the fuzzy, smiling face of one Musalia Wycliffe Mudavadi. 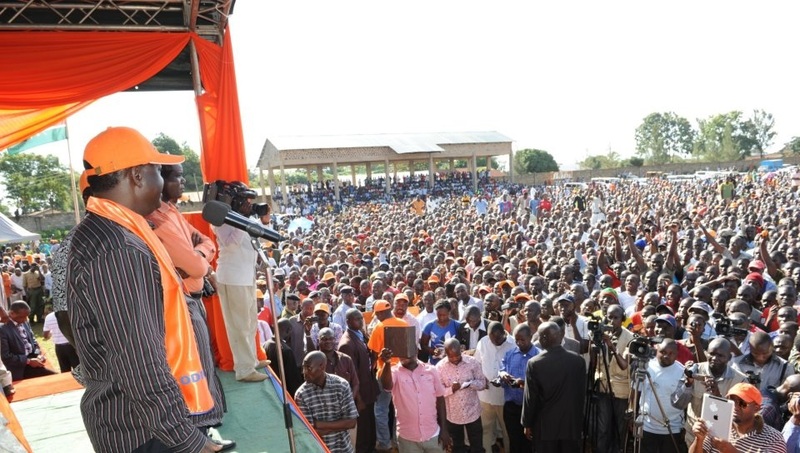 “First, we would like you to challenge and defeat Raila as ODM flag-bearer,” came the answer. The schemers and MM could not contain themselves with excitement of even the thought of MM defeating Raila as ODM flag-bearer. It should be noted, however, that KSG involves two sides playing against each other with one side represented by one team, namely the Awambo Annihilators (AA), while the other side has several teams all morphed into one and we can call this the Desperados. It is also important to note that within the Desperados, there are two distinct camps which don’t necessarily see eye to eye on everything and one can even say they are busy scheming against each other as it is. The so-called G7, for example, is a major wing of the Desperados but its goals and objectives are not necessarily the same as those of the Inner Sanctums who are few but wield enormous power and influence because of their proximity to Kibaki. In Part II, I will disclose what I know through my own impeccable sources as to the current state of the KSG. I have not even finished reading your article but am already wary and afraid. You don’t expect me or anyone for that matter to it when you are already preaching falsehood. You say that he’s better poised to tackle corruption and impunity, I say impossible! Not unless he comes clean on the molasses plant acquisition saga, the maize scandal and, yes, the PEV because contrary to what Ocampo wants everyone to believe, some of us believe he was the mastermind and until the genuine minutes of that very controversial meeting are released, we will continue believing and knowing he was the main cause. The “we” here stands for those of us who are open-minded and informed and shun fanaticism and sycophancy. Sorry to note but the latter two are either a delicacy or a part of the instinctive character of Raila’s supporters. Let me pen off for now but note that I would appreciate if you lay Raila on the table and disect him politically without favoritism or prejudice. Omwenga toboa siri. I agree with you but to add on the theme of these elections is “retention of the political class.” Raila’s win will be a triumph of the people of Kenya while his lose will be a triumph of the political class.